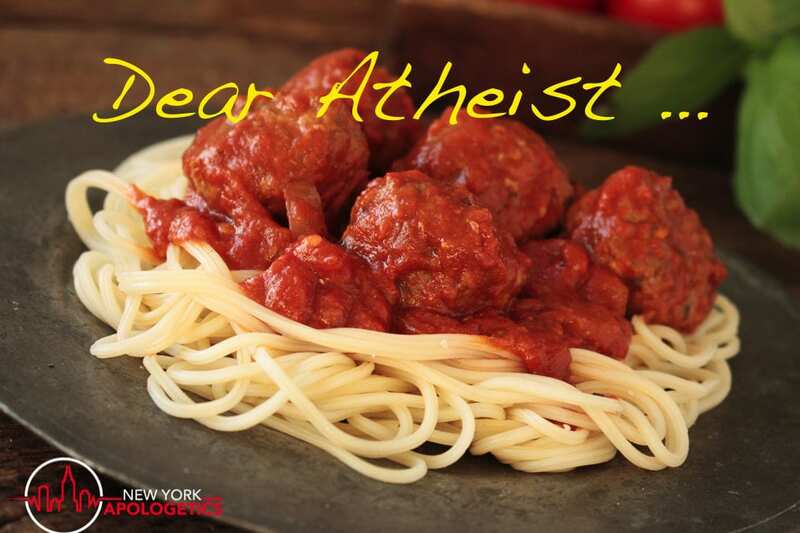 Dear Atheist ……Flying Spaghetti Monster? Welcome our blog article title Dear Atheist. These segments entitled Dear Atheist, talk about issues commonly asserted by atheists toward those who believe in God. If you have a comment or disagree, please feel free to state and support you reasoning below. Dear Atheist, it is not uncommon for Atheists to sarcastically refer to God as a Flying Spaghetti Monster. As with any other made up religion, this even one comes with its own gathering called the “Church of the Flying Spaghetti Monster”, whose members sometimes refer to themselves as Pastafarians. So for all you Atheists who think this makes sense, even sarcastically, you may want to think about Cosmology for a moment. The consensus in cosmology is that the universe had a beginning a finite time ago at the Big Bang. (About 13.7 billion years.) The universe of course, being made up of Space-time and matter implies that anything outside the universe (it’s cause) cannot be made of matter. If matter existed before the universe, then the universe created itself and that’s not possible. Therefore, as you say your God is made of spaghetti (matter), you violate the laws of logic and you violate what is known about the universe in current cosmology. Dear Atheist, Perhaps this will help you. God by definition is the greatest conceivable being and as such would have great making properties. Would it be greater to be all powerful or somewhat powerful? All powerful. Would it be greater to be know some things or know everything? All knowing. Would it be greater to be everywhere at once or relegated one location? Omnipresent. Would it be greater to be created or exist by necessity? To exist by necessity. It would seem that some atheists think that making an unsupported claim is somehow an argument for the truth. If you want to be taken seriously, and you feel as though you have a real argument or thought that can be supported, we would love to hear from you. If not, then by all means cook up a nice bowl of spaghetti. This has to be a joke. I know it’s a joke because in your last sentence you used than instead of then. Typo = joke in your worldview? Hilarious! Pasta time. Pastafarians have imbued the flying spaghetti monster 👾 with all the same attributes as the Christian god. His noodley appendages transcend time and space. Now, how is your god better? Let me try out your method of reasoning. I have just unimbued the flying spaghetti monster with any God like attributes. All that remains is a plate of spaghetti. That was easy! So Chad, I can see you’re no longer an atheist. Congratulations in recognizing an intelligent, transcendent creator. Saying FSG (peace be upon him) is a deity, is just as provable as saying the Christian god is a deity. Do how can you prove your good is better? When you say provable, do you mean with the laws of logic? No, I mean to know, not to believe. These words are commonly used interchangeably in religious circles, but are drastically different. To know, means you have a repeatable way of showing existence. To believe, means you can logic your way through to result. How can you “know” anything on your worldview? Doesn’t knowing something require an immaterial mind and reasoning? Without an immaterial mind, your brain is just spewing out reactions of chemicals in the brain. Please tell me more about MY world view. According to your worldview, your brain evolved out of the soup via random mutations and natural selection. That means: (1) your brain is only capable of spitting out thoughts that are based on your brain chemistry, which in turn is based on preexisting conditions beyond your control; (2) your thoughts evolved for their survival value rather than their truth value, which are not necessarily the same thing; (3) given 1 and 2, “empiricism” is substantively meaningless, because you — and all other humans — are incapable of actually analyzing data and coming to an objectively true conclusion about it. All you are able to do is absorb data via your five senses and spit out whatever “conclusion” your brain was predetermined to produce given that input. Logic, the scientific method, etc., are all useful fictions at best. Good luck with that. Do how can you prove your good is better? = How can you prove your God is better. Chad is right, the authors arguments work agaist his own position when expanded to include his own religion. FSM is just made up… just like GOD… and who says you can’t have something before the big bang that’s material? Dumb argument. Have some of you been there? Face it, we’re all trapped in a computer matrix. You see, you say a few things that just make me lose the hope that a Christian is finally speaking sense. I don’t refer to God as flying spaghetti Monster or anything else as he doesn’t exist. There’s never been proof he does or that he created the universe etc. In fact the telling of the six days of his creating in Genesis is so full of holes and obvious implausibilities that it can’t be taken as real by any intelligent person. Whereas after over 70 years of researching by scientists, physicists, mathematicians, astronomers, radiographers, nasa technicians using instruments of technology such as microwave signals, radiation telescopes, satellites, probes they have proven that the earth did begin out of ‘nothing’. It took a lot of events and 100 billion years but Earth was born. The scientists have a chronology of the big bang cosmology. Even if you still wanted to deny that’s how it all began, there’s a lot more research, study, tests, technology, intelligent men involved over decades than there is involved in any proof of gods existence. The Line “Atheists think that making an unsupported claim is somehow an argument for the truth.” The claim I make about the big bang is far from unsupported….And is not a ‘claim’. Actually a Christian writing a line like that is really embarrassing. No Christian ever has ever made anything BUT unsupported claims for God’s existence. How can Christians intelligently keep ridiculing people who don’t believe in God? Where’s your proof of gods existence?